This is a very old subject. But thanks to a way to motivated workmate, who used to drop “regions” in every code, we talked about this subject again. Are #regions good or not? For all of you who don´t know what the hell Im talking about: #region on MSDN. “…“ stands for countless other stuff. Im interested in the Code not in any kind of blocks. With the use of #region the only thing you do is to shroud the code. 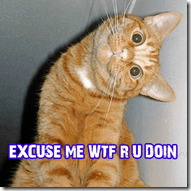 When I open the user.cs I want to see the code on the first sight. Yes, there is a hot key to make the code visual but why should I use this #region blocks? Often I find some #regions in classes where the code consists of endless lines to give it a little bit more structure. I have the problem that I even so want to see the code. So I click to open it. Fascinating…. but wait… what happens on Y? Every good thing is three…. What´s written behind Z? Fantastic isn´t it? Of course the code in my example is nonsense but in fact there could be kilometres of code behind X,Y and Z. There are too many responsibilities in this class and somebody try to hush this up. Better: Split it! And with this I didn´t mean into “Partial Classes” but into separate function units. 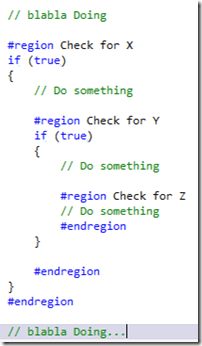 Another example: Visual Studio always put interface implementations in #regions. I don´t think that´s nice (and its possible to stop it ;) ). Is it really helpful for structure? In my opinion there are way better opportunities since VS2010. So I don´t need any #regions. 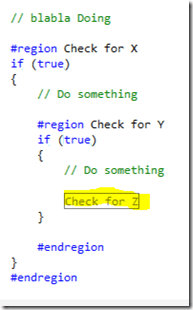 If you are creating “On-the-fly” codes (e.g. 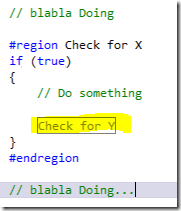 with the TDD Manier), Visual studio used to place the code somewhere as well. That proofs that the system of #regions is to be doomed to failure anyway.